Prime Minister Netanyahu releases new video blasting the Palestinian Authority for naming schools and streets after terrorists. "I want you to close your eyes and imagine," Netanyahu began. "I want you to imagine a seven-year old girl named Fatima. She is walking to school with her mother, and sees a statue, and asks 'who is that?' Her mother answers-that is Khaled Nazzal. He planned the murder of 22 Israeli school children and four grown ups." Netanyahu continues in a similar vein, pointing out the various monuments the Palestinian Authority has erected to terrorists Dalal Maghrabi, who murdered 38 Israelis in 1978's Coastal Road Massacre, and Abu Sakkar, responsible for the death of 15 Israelis. 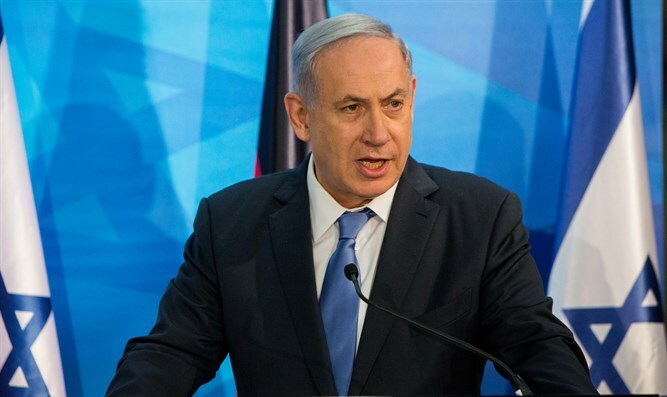 "Children should be taught to love and respect, not hate and kill," Netanyahu concluded. "There are so many champions of peace to dedicate statues to. Why do the Palestinians consistently choose to honor mass murderers?" The carefully-crafted video style has become one of Netanyahu's trademarks. The Prime Minister started releasing short video clips of himself speaking out on selected issues back in 2016, with the videos often going viral, racking up hundreds of thousands of views within a few hours. The videos usually follow a similar format: Netanyahu sits behind his desk, a portrait of his family on his right, an Israeli flag to his left, and speaks in English directly to the camera.